Strawberry and Marshmallow Skewers – 190kcals and 8.3g fat per serving. 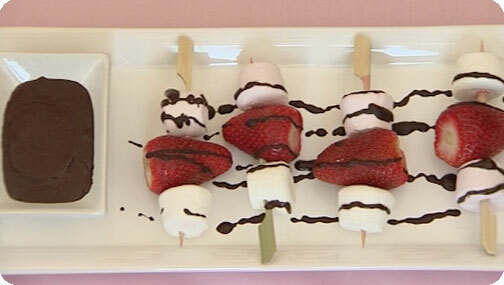 Put the strawberries and marshmallows onto skewers alternating them as you go. Melt the chocolate for 30 seconds in the microwave, give it a stir then plunge the kebabs into the chocolate as you munch!